When you are at your local hardware store searching for the best sliding miter saw, or chop saw, there are a few considerations to make. You probably already know the difference between a standard miter saw and a sliding saw. You probably want a miter saw that can deliver both bevel cuts and miter cuts, but you also want the versatility of having a slider feature, similar to a radial arm saw, that allows you to move the blade forward and backward along with the advantage of the ability to cut through wider pieces of wood. View the Best Sliding Miter Saw for the Money, Below. Should I get a Sliding Miter Saw? 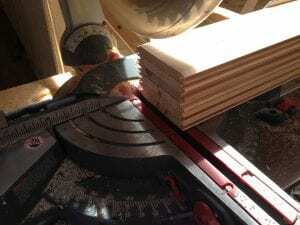 Why Use A Sliding Miter Saw? 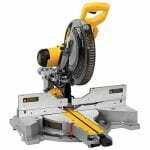 Best Sliding Miter Saw For Home Use? Which Sliding Miter Saw is Best? Right now, you just want to do a little more research to find out what would be the best saw for your specific cutting needs. Look no further, we have done all the footwork for you based on best performance, durability, and best price, and narrowed down the selection to our Top Ten Best Sliding Miter Saws. Featuring precise cutting without recalibration, this DWS780 model offers solid construction and has the new XPS cross-cut alignment system with an improved ultra-bright LED light, which allows the user to see precisely where the blade will come in contact with the material by casting a laser-like shadow. This powerful, 15-amp, 3800 RPM tool features durable guards precision-machined castings, fences, a bevel system, and rugged stainless steel detent plates that are designed to hold up to the rigorous demands of the job site. The dual-bevel system sports a high-visibility scale and easy angle adjustment, beveling from zero to 49 degrees with positive stops at 0, 22.5, 33.9, 45, and 49 degrees in both right and left directions, with a detent override. See more information on DEWALT DWS780. This is a well-built tool that comes out of the box ready to go, producing the best cuts that are accurate and beautiful. Perfect for custom work, the DeWalt DW715 has a great angle adjustment and runs clean and smooth. We love accurate gauges, and the XPS positioning LED, which uses the shadow of the blade to cut. Brilliant. This compact Festool Kapex KS 120 saw delivers a professional and incredibly precise results whether in the workshop or on the job site. With advanced electronics that include dual laser guides, micro-bevel adjustments, quick-release fences, and easy-to-reference scales, plus a host of other smart features to provide the best, most precise cut. There are dual lasers that accurately and clearly define what will be removed during the cut, and the three-axis adjustment controls make it easy to fine-tune the lasers, which are electrically powered, requiring no batteries. the center-positioned handle allows ambidextrous cutting, and a two-stage trigger helps prevent accidental triggering. The rotating knob uses a rack and pinion technology to move the counter-spring balanced head. This means that once you set a bevel angle it will stay in place before you engage the dependable bevel lock. See more information on Festool Kapex KS 120. This tool preformed as well as expected - even better. The dual laser proved to be ultra-accurate - which in itself is well worth the cost. The optional 36mm hose and MFT clamps are worth the investment, as it was able to provide incredible dust collection. As far as slider saws go, this model is very convenient and portable. If you need the best in smooth, precision cuts and crosscuts with a variety of materials including wood, panels, soft fiberboard, hard board, plywood, and aluminum sashes, look no further - this tool does it all. Powerful and reliable, this saw includes positive angle stops to let you select preset points at specific angles and has a 45 degree bevel for more precise cuts. This tool also includes a dust collector to help keep the interior components clean, and a nice, comfortable elastomer grip that is made to reduce vibration and help maintain control at all times. Hitachi stands behind this miter saw with a five-year professional warranty. We like the fact that this tool isn’t too complicated - it provides the best amount of what you need and want in a chop saw. Ready to go out of the box, it is a solid, powerful, and versatile tool that performs well on several materials with sturdy support. The included blade makes clean, sharp cuts, and isn’t too heavy - the soft grip makes it easy to carry around. With all the functionality of normal saws, with a super-power to cut through materials that were never thought possible, this powerful 10-inch compound saw will cut fast, clean and accurately through steel, aluminum, plastic, and wood - even with nails - with just one blade. No sparks, no heat buildup. Other useful features include an in-line handle for ambidextrous use, adjustable cutting depth for better grooving, an accurate laser guidance system, and a durable casing. The high-torque, 2500-RPM motor and optimized gear box complete the deal. Sold separately are a full range of blades that will turn this saw into a tile cutter to allow for more precise metal cutting applications. Includes a three-year limited warranty. See more information on Evolution Power Tools RAGE3. With a nice, solid finish, and tight adjustments, you can already tell this is a well-made tool. The soft start is nice and the power it produces is impressive. This saw makes cuts accurately, and the lightweight quality makes this power saw one of the best in convenience and handling ease. This 12-inch dual-bevel glide miter tool features a powerful 15-amp motor that delivers a smooth, accurate cutting performance with a space-saving design, exclusive to the Bosch Axial-Glide System. The square lock fences are pre-aligned to maintain a lifelong accurate cutting. This tool sports a soft-grip handle along with a combination dust chute and vacuum adaptor for best user comfort and a clean operation. The no-loads speed of this durable saw delivers quick cuts in many different materials, and this tool is compatible with a variety of 12-inch blades with a clear lower guard to provide the best in clear, cut-line visibility. This reliable and versatile tool provides straight, angle, bevel and compound cuts all in one compact machine. With 15 powerful amps and a highly impressive 5000 rpm, this machine is able to easily tackle anything that is put in front of it. The spacious work table 120 square inches of depth while the support are will extend for a total of 32 inches of material support. Combine all this with a 40-tooth carbide blade, a lightweight design and a one year warranty, and you have a miter tool that is hard to resist. See more information on WEN 70712. This tool cannot be beat in its versatility. Adaptable to many materials and multiple uses, and we found that it is also quieter than other models as it cuts. The large worktable functions well for most projects and the motor provides the best power to push through the more challenging work with no problem. There are a lot of nice features too long to list, all packed into an impressively lightweight design. DeWalt does it again with a powerful 15-amp motor that delivers the best in durability and power to your cutting project. The tall fences will support crown molding up to 5 1/2-inches nested and base molding up to 4 1/2 -inches vertically, and easily slides out of the way for bevel cuts. There is a stainless steel detent plate that adjusts to 13 positive stops to improve the cutting accuracy and performance. The miter system and base fence support provides the best durable precision in cutting. Includes a carbide blade. Milwaukee has always been a trusted brand with professional contractors, and this saw maintains that reputation with some amazing features and ease of use. As with many other miter saws, this one has a 15-amp motor, but what sets it apart is how it maintains a constant cutting speed under load, and it doesn’t bog down, providing the best clean, consistent cut. There are so many features we don’t have the room to list, but try it out yourself - you won’t be disappointed! Right out of the box, the Makita LS1216L starts delivering accurate, large cutting performance. This versatile tool has a patented retractable guard system for improved vertical cutting capacity and largest crown molding cutting capacity. The powerful 15-amp soft start, direct gear box motor never slips or bogs down like belt-driven saws, and the electronic Speed Control maintains a constant speed under load for a smoother, high-quality cutting. See more information on Makita LS1216L. This Makita slide compound miter tool cuts precisely and slides smoothly to handle any type of woodworking project. The 15 amp motor provides more than enough power to handle any application, the huge 12-inch blade makes larger mold cuts easy, and the laser is a great asset. Easy to adjust and setup, and a great quality to price ratio. For versatility and easy handling, this powerful Hitachi C10FSHC with a 15-amp motor performs well with a no-load speed of up to 3200 RPM. The precise Laser Marker gliding system makes cutting large framing pieces easy, and it can easily be adjusted according to user preference. There is a 60-degree angle to the right and a 55-degree angle to the left, providing ultra flexibility. The soft start function reduces noise and recoil during startup. Hitachi stands behind this miter saw with a five-year professional warranty. See more information on Hitachi C10FSHC. Here you are, perusing your favorite hardware store like a kid in a candy store, drooling over the selection of saws and your wallet is burning a hole in your pocket because you know you must have one… but you’re not sure which one to get. You know you want the most bang for your buck, and the ability to make both angle and bevel cuts, so you know it has to be a compound miter saw. Stationary compound miter saws, or simply, “compound miter saws”, (similar to circular saws) are specialized saws that do more than just cut simple angles – they have an arm that pivots which allows the blade to be tipped to the side, resulting in a “bevel” cut. Typically, these saws are referred to as “compound” because having the tilted angle and the angle planes make it possible to cut two angles at the same time. A big advantage to having this type of saw is that you are not limited by any rails, and you have a greater cutting arc than with a sliding compound miter saw. This is an important factor to take into consideration, especially if you are cutting corner joint moldings like crown molding or framework. However, there is a limit to the width of material that can be cut with a compound saw. For example, a 10-inch compound miter saw can only cut up to six inches wide – which really isn’t a bad thing because most woodworkers will rarely need to cut anything wider than that. All in all, a compound miter saw will most likely be able to handle most of the work you throw at it, and they are best for projects like crown molding. If you’re looking for a more precise cut, check out our Jigsaw reviews here. These types of miter saws have all the versatility of compound miter saws, but with more flexibility in that, it has an arm or arms that allow you to move the blade both forward and backward and provides an increased cutting length. The notable difference between a sliding compound miter saw and a stationary compound miter saw (whew – long words there) is that the sliding saw has rails which allow you to slide, or glide the saw head forward and backward while cutting. Having this “sliding” function increases the overall cutting capacity of the miter saw greatly, in terms of how well it handles the material’s thickness. For instance, when cutting a thick material like a fence post, a sliding compound miter saw handles this much better than a regular compound miter saw. These miter saws are also used frequently for cutting other thicker woods like lumber, boards, and logs. Both of these types of miter saws are available in single or dual level models, and this review so far has applied to single bevel models, which means they only allow you to make bevel cuts in one direction, left or right. So to make matching cuts you would need to flip over the workpiece and reset the angle to make sure it’s accurate before moving on to the second bevel cut. 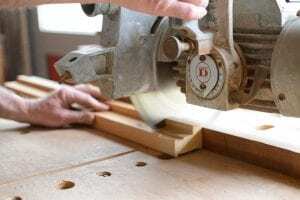 But with a dual bevel miter saw, you are able to make compound cuts in both left and right directions without having to turn your piece over – instead, you just use the pivoting arm to accurately flip the miter saw. To summarize, this miter saw is best for those larger, heavier duty jobs and for cutting wider materials, and you will be able to do much more with a larger cutting capacity, and a larger price tag to go with it, but makes one of the best investments for its value. Sliding compound miter saws have all the versatility of compound miter saws, but with more flexibility in that it has an arm or arms that allow you to move the blade both forward and backward, and provides an increased cutting length. These types of compound miter saws are used for cutting thicker materials like lumber, boards, and logs. There are several miter saws out there that can create angled cuts. That being said, miter saws are the best choice for this job because they provide a high level of precision. The miter saw’s blade is positioned in such a way that you can cut in a very fine tuned way until you manage to get the desired result. The arm’s stability is one of the defining features of the miter saw’s overall quality, so you will need to take this into consideration when searching for the best type of miter saw. There is no such thing as the best rated miter saw, no matter what it’s capabilities are. For example, it is impossible to rip the width of lumber with this miter saw, this job is generally done with a table saw (click for review) or band saw. However, there are some tricks of the trade you can apply to increase the cutting capacity, including a sliding miter saw. A sliding miter saw has all the features of a compound miter saw, but similar to a radial arm saw, this allows you to move the blade forward and backward. This provides the potential for cutting at an increased length. There are a number of these outstanding saws available on the market, and here are just a few of the hard-hitting models we have researched and reviewed to make your work – and life – easier. With a solid construction and a powerful, 15-amp motor that delivers 3800 RPM, this miter saw is made for the best performance, with its durable guards, precision-built castings, fences, and bevel system. The steel miter detent plate is built tough to withstand abuse on the job site. The power cord is conveniently routed through the back for convenience, and the miter saw offers a variety of industry-leading cutting capacities, along with a rail lock latch for holding the head away from the fence. The high-visibility scale and easy angle adjustment make the dual bevel system easier to see and use on the construction site. The XPS positioning LED is an ingenious feature and provides a super-sharp, precise cutting by shining a light down on the blade, casting a shadow from the blade that provides the guide. DeWalt continues to provide an exceptional miter saw with smooth, accurate cuts and has received a high-star rating for its performance and value. Compact and lightweight, weighing only 47 pounds, this easy to handle Festool Kapex KS 120 Sliding Compound Miter Saw delivers professional results, and comes with a high-quality 60 tooth carbide blade for cutting woods or soft plastics with ease. The dual lasers help clearly define for more precise cutting and align cuts from the left or right side. Fine-tuning the lasers are a breeze with the three-axis, electrically powered adjustment controls. The center-positioned handle allows ambidextrous cutting, and a two-stage trigger helps prevent accidental triggering. Once you have set a bevel angle, you can be assured it will stay in place before you engage the dependable bevel lock with the rack-and-pinion based rotating knob. The hold down clamps are a genius feature to this saw, and the dual laser is ultra-accurate, making this miter saw well worth its value. This Festool Kapex KS 120 miter saw is very convenient and portable, and best for furniture work, cabinetry, and crown molding projects. With a 15 amp motor that delivers a 5000 rpm speed, the Hitachi C10FCG provides ample power for all your beveling and cross cutting work. The laser alignment technology provides super-precision to your cuts, and the 10 inch blade spins faster than larger miter saws, which means a smoother cut with more torque. There’s an ingenious laser alignment that helps position your cuts down to the fraction, and there are bottom clamps that secure nicely to the work table, providing more control over your cuts, with handy clamps to secure your workpieces in place. Hitachi is a trusted name in miter saws, and this model lives up to its name in durability, precision, and power. At just 27 pounds, this compact miter saw is easy to maneuver and transport, and comes with an impressive 5-year warranty. Overall, the Hitachi C10FCG s the best value miter saw, well worth the cost. Well renowned for it amazing flexibility and versatility, a sliding compound saw is an essential miter saw for many professional and DIY woodworkers. It multitasks with a blade that swivels for miter cuts, and a head that tilts for bevel cuts. To make those compound cuts, all you have to do is swivel the blade and tilt the head. The big difference between this miter saw and a standard compound miter saw is in the capacity – A typical sliding miter saw will easily cut a 12-inch wide board, which is three to four inches wider than the largest board a standard miter saw can cut. 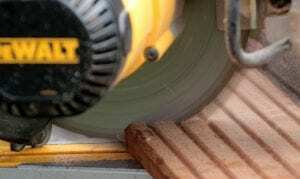 In addition, a sliding compound miter saw will easily make cuts that are normally very difficult on a table saw. For example, being able to accurately miter the end of a long, wide board is just about impossible with a table saw, because the miter gauge is too small, and the table is insufficient to support the angled board during the cut. However, using this miter saw, simply position the board, swivel the blade, align the laser guide and you’re ready to roll. It’s easy to switch from one type of cutting to another, so going from big timber crosscutting to compound miter cutting for delicate trim work will take only seconds to complete. When shopping for the best sliding miter saw to handle your specific needs, there are a lot of factors to consider. Before choosing a saw, it is good to know the unique features of miter saws. Designed for crosscuts and miter cuts: The purpose of miter saws is to perform these types of specialized cuts. Laser guides that help guide position: These will show you how your blade will place on the material before you cut, helping you avoid any mistakes. Many diverse models: There are three main types of miter saws to fit your specific needs: The basic saw, the compound saw, and the sliding compound saw. Miter saws are measured by the size of their blades: The common sizes are 7 ½ inches, 8 ½ inches, 10 inches, and 12 inches. For wider cuts, the larger sizes are the best options. For more advanced features, the smaller sizes are the best choice. Dust collection is imperative: Most of these miter saws feature a dust bag or some sort of collection system, but they don’t capture all of the dust. You should choose a saw with a hookup adaptor for shop vacs. Locked-in angle technology: For more precise angle cutting, your miter saw should have custom positive stops at certain angles. Built-in clamps: Larger saws usually come with upgraded clamps attached that will help hold your material in place, or have a place designed to install your own clamp. Shock-absorbing handles: Look for a saw that has vibration-reducing handles – these are much more comfortable in handling through long-lasting projects. Sliding miter saws are available in many sizes, according to the diameter of the blade – either 10-inch or 12-inch. Read below for our extensive review on our recommendations for the best sliding miter saws based on performance, accuracy, and value. Makita LS1018 10″ Dual-Bevel – Everything you have ever wanted in these saws, but in a lightweight, compact design, the Makita LS1018 doesn’t disappoint with its accurate delivery and optimum cutting performance. This versatile miter saw is powered by a 13-amp direct drive motor with soft start, which means a smoother startup. This corded model provides a consistent power that remains constant with no parts to replace and is best for finer woodworking, carpentry, and general construction. There are five stops with bevel cuts to 47 degrees, and a linear ball bearing system made for “dead on” accurate cuts, plus a convenient electric brake. This Makita slide compound miter saw cuts precisely and slides smoothly to handle any type of woodworking project. The 13 amp motor provides more than enough power to handle any application, and the blade that is included with this set cuts precisely and sharp. Easy to adjust and setup. Highly recommended for the average woodworker and DIY’er for a variety of applications. WEN 70716 10″ Compound – This miter saw packs an impressive punch with its 15 amp, 5500 rpm motor that is able to slice easily through just about any type of material, providing accuracy in straight, angle, bevel, or compound cuts. The large worktable is convenient for working on larger boards up to 11 inches in depth. There’s a 60-tooth carbide-tipped blade for producing sharp, accurate cutting. The dust collection bag helps with dust cleanup. The overall lightweight, compact design of this miter saw makes it easy and handy for transporting onsite or offsite, and the generous two-year warranty brings peace of mind, combined with a trusted name in power miter saws. This saw cannot be beaten in its versatility. Adaptable to many materials and multiple uses, and we found that it is also quieter than other models as it cuts. The large work table functions well for most projects, and the motor provides ample power to push through the more challenging work with no problem. There are a lot more nice features that are too long to list, all packed into an impressively lightweight design. Having a sliding miter saw makes one of the best tools to add to your repertoire of workshop miter tools that will make complicated cutting and bevel an absolute breeze. Make a great investment that will save you tons of time and frustration, and will deliver a finished, high-quality piece. With a solid construction and a powerful, 15-amp motor that delivers 3800 RPM, this miter saw is made for performance, with its durable guards, precision-built castings, fences and bevel system. The steel miter detent plate is built tough to withstand abuse on the job site. The power cord is conveniently routed through the back for convenience, and the saw offers a variety of industry-leading cutting capacities, along with a rail lock latch for holding the head away from the fence. The high-visibility scale and easy angle adjustment, makes the dual bevel system easier to see and use on the construction site. The XPS positioning LED is an ingenious feature and provides a super-sharp, precise cutting by shining a light downward on the blade, casting a shadow from the blade that provides the guide. DeWalt continues to provide an exceptional miter saw with smooth, accurate cuts and has received a high-star rating for its performance and value. Compact and lightweight, weighing only 47 pounds, this easy to handle Festool Kapex KS 120 Sliding Compound Miter Saw delivers professional results, and comes with a high-quality 60 tooth carbide blade for cutting woods or soft plastics with ease. The dual lasers help clearly define for more precise cutting and align cuts from the left or right side. Fine-tuning the lasers are a breeze with the three-axis, electrically powered adjustment controls. If you’re looking to cut metal, take a look at these metal cutting saws. The center-positioned handle allows ambidextrous cutting, and a two-stage trigger helps prevent accidental triggering. Once you have set a bevel angle, you can be assured it will stay in place before you engage the dependable bevel lock with the rack-and-pinion based rotating knob. The hold down clamps are a genius feature to this saw, and the dual laser is ultra-accurate, making this saw well worth its value. This Festool Kapex KS 120 miter saw is very convenient and portable, and great for furniture work, cabinetry, and crown molding projects. For innovation, technology, and best in class warranties, Hitachi is the name to trust in power tools, including saws. A compound saw is able to cut both miter and bevel angles at the same time, and a 10-inch blade spins faster than the larger miter saws, meaning a smoother cut at less capacity. This 15-amp miter saw delivers a 5000 rpm speed, which is ample power for your beveling and cross cutting. Weighing in at under 25 pounds, the Hitachi C10FCG is one of the lightest 10-inch miter tools on the market, making this miter saw easy to tote around your work area. Along with a powerful motor and a whopping five-year warranty, this miter tool is well worth the money and is a best value option. Make sure you stay aware of the miter saw safety hazards with this study. For an overall look at wood shop safety – click here. We hope you enjoyed our article on "The 10 Best Sliding Miter Saws", if so, please share and rate it.